A well located within a neighborhood in Weld County, CO. Many communities in the Intermountain West are facing challenges that come with oil and gas development, as development can have both negative and positive environmental, economic and social impacts on communities. Unlike previous oil and gas developments, the recent push has brought a large number of wells within close proximity to more heavily populated areas. Establishment of a working relationship with industry can help to both address and resolve issues stemming from development, and lay the foundation for an ongoing dialogue between community stakeholders and industry. Since an informed community is crucial to clear communication and cooperation among interested parties, this page is intended to provide communities with the resources they need for successful planning, coordination with industry, and navigation of regulations that apply to oil and gas operations. Hydraulic fracturing wells require an extensive amount of infrastructure and supplies that must be transported to the site, maintained, and later removed. The initial build and continuing operation cause both construction and traffic noise. The drilling of the well and the physical fracturing process can last from three to five weeks and may be much longer for multi-well pad sites. During this time period nearby residents may be exposed to 60-75 decibels of constant or intermittent noise. Hydraulic fracturing wells are operated throughout the night. As a result, the well pads are heavily lit. The current regulations for light pollution in the fracturing industry are minimal because many states exclude the oil and gas industry from light pollution laws. The light pollution from fracturing wells is a nuisance to neighboring communities and diminishes nighttime aesthetics. However, preserving night skies has become an increasingly widespread goal due to the work of organizations like the International Dark-Sky Association and the McDonald Observatory’s Dark Skies Initiative. The use of best management practices to minimize light pollution is becoming more prevalent in the oil and gas industry. The report, Oilfield Lighting Can Coexist with Dark Skies (insert internal link from Bibliography database) suggests that new fixtures are switched to LED and that previously existing fixtures be re-aimed and shielded to funnel the emitted light towards the ground. During the hydraulic fracturing process a mixture of water, chemicals and proppants is ejected underground, brought back to the surface, and then stored on site. The movement and storage of the water mixture has potential to pose a risk to the surrounding water sources. This can be an especially large concern for residents who use private wells as a main water source. For more detailed information see the Water Quality Resources or Hydraulic Fracturing page. In order to construct and operate a well site, large trucks must transport all the materials to the site. The increase in large truck traffic results in large amounts of regular and diesel emissions into the local air. Also, various toxic hydrocarbons like benzene, toluene, and xylene can be emitted at the well pad or by other onsite facilities. Exposure to some of the hydrocarbons emitted on hydraulic fracturing sites can result in various health problems. It is common practice in the oil and gas industry to dispose of excess gas through flaring. The main byproduct of the combustion is the greenhouse gas carbon dioxide. More detailed information can be found of the Air Quality Resource page. Property Value: Communities are concerned about the impact of oil and gas development on their property values. The presence of well pads and associated infrastructure near a home can have a lot of implication on property values. Boom-Bust Cycle: The Boom-Bust Cycle results from a rapid expansion and contraction of the local economy. Well field developments require employees that are highly trained and very specialized, but far fewer employees to maintain the facilities for the production phase. As a result, many of the onsite employees travel to well sites and then leave, once the well field facilities are built or the fracturing process is complete. 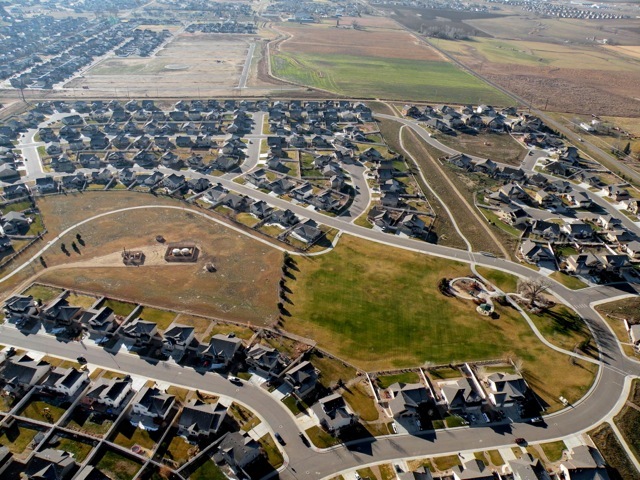 A Colorado Case Study found that many rural communities in Colorado have experienced the Boom-Bust Cycle or “boomtown effect”. Community members may also visit this website’s Resources pages. The Development Process page provides an overview of oil and gas development. The Wildlife, Water Quality, Air Quality, and Vegetation resource pages provide specific information about the potential impacts of development on each resource. The Reclamation page can help communities plan development with reclamation in mind. The Geographic Information Systems page links the user to downloadable data, open-source software, and various maps that can help communities document and examine impacts to effectively manage development in their area. Constructive engagement is an approach that brings communities, local governments, environmental groups and oil and gas companies together to address social and environmental issues through cooperative, non-adversarial partnerships. These partnerships may not always be appropriate or effective, but knowing what they are and how they work can give communities an alternative to conflict and litigation. For more information, see CDR Associates’ CE Powerpoint on the Workshop page. Though many communities may only require open lines of communication and a good working relationship with industry, a more formal collaborative process can be a useful approach to finding solutions to contentious issues. Collaborative processes inform stakeholders, foster discussion between parties in a non-adversarial environment with the help of a facilitating, neutral party, and allow stakeholders themselves to explore and develop solutions to their problems. Whether communities turn to collaborative process or other forms of constructive engagement to address development issues, it is important for the process to involve all stakeholders from the beginning, to establish the process’ legitimacy, to make use of facilitation and technical advice as needed, and to address the economic, social and environmental concerns of the community. The following plans and agreements address natural gas development in identified geographic areas. The areas may vary in size, but all address development on a scale larger than a single well permit site. Two of the plans are established in statute or regulations; the other plans and agreements are processes independently initiated between communities and industry. All are intended to form good working relationships between communities and the oil and gas industry. For more information on Comprehensice Drilling Plan, see the Battlement Mesa case study. A comprehensive drilling plan (CDP) is a Colorado specific plan that identifies expected oil and gas development within a specified geographic area, the potential impacts, and measures to mitigate those impacts on public health, safety, and the environment. Operators voluntarily initiate and enter into a CDP, but are required by the Colorado Oil and Gas Commission (COGCC) to develop the CDP in participation with the Colorado Parks and Wildlife (CPW), Colorado Department of Public Health and Environment (CDPHE), local governmental agencies, and surface owners. Operators may determine the issues that are addressed in the CDP while being encouraged to provide detailed information. CDPs typically cover the activities of one operator, although operators are encouraged to develop joint plans covering the proposed activities of multiple operators where appropriate. Once a CDP is approved, the operator is not required to submit Form 2A to identify impacts of development and that otherwise must be approved by the COGCC before a drilling permit can be issued. A CDP can be valid for six years after approval. The Colorado legislature authorized use of GAPs in 2008, but no GAPs have been prepared to date. A Geographic Area Plan (GAP) is a Colorado-specific planning tool for addressing cumulative impacts from oil and gas development. The GAP covers entire gas fields or geologic basins and can include activities of multiple operators in multiple sub basins or drainages over a period of ten years or more. The plan is intended to assist the COGCC to adopt basin specific rules that address unique geologic or hydrological features. The COGCC first publishes a notice of intent to initiate a GAP which then allows for a public participation process. The COGCC then consults local governments and other agencies such as the CPW, the CDPHE, County Commissions, and local government designees. The COGCC also considers any local government comprehensive plans or other long range planning tools for the GAP. This plan may include development scenarios, designate units, adopt spacing orders, implement sampling or monitoring plans, or require consolidation of facilities. A community development plan (CDP) is a plan made between the community being affected by oil and gas development and the operator. This plan is a voluntary agreement that identifies the potential impacts of development on the environment and on community well-being. The CDev'tP also includes best management practices to be implemented by the operator to address those impacts agreed upon by community members and the company. The goal of a CDev'tP is to initiate a relationship between community and operators that will promote transparency, reduce conflict, and give the community an opportunity to participate in decision making regarding oil and gas development in their area. For an example of a watershed agreement in Colorado, see Community Spotlight: The Watershed Plan for the City of Grand Junction and the Town of Palisade. Watershed agreements are non-binding agreements created between corporations and communities. The primary goal of a watershed agreement is to allow for development of natural resources, specifically oil and gas, while ensuring the protection and reclamation of the watershed health. In such an agreement, companies adhere to best management practices that protect the watershed by defining baseline water quality conditions and maintaining or improving these conditions over the development period. Companies may agree to hire a third-party that oversees monitoring and studies of the water quality throughout the development process. For oil and gas development, BMPs may include, green fracturing, fracture tracing, clustered development well pad spacing, and closed loop drilling systems, among many others. For an example of a Good Neighbor Agreement, see the Stillwater Good Neighbor Agreement. A Good Neighbor Agreement (GNA) is an agreement between a community and a corporation whose development poses a pollution threat for that community, usually in the form of water or air pollution. In a GNA, which can be legally binding, companies agree to disclose all potential pollution producing activities while also using best management practices that mitigate any unnecessary pollution. Best management practices are implemented by the company, on the basis that the community members agree to abstain from protesting or legal action that could delay or stop the development process. As part of the agreement, community members typically have input and decision making power regarding the company’s operations. A wildlife mitigation plan (WMP) is another Colorado-specific plan. Like CDPs and GAPs, it is based in COGCC rules. Unlike these other large-scale plans, a WMP has a single resource focus: to avoid, minimize and mitigate impacts from oil and gas activities to wildlife. A WMP is developed by an operator and the Colorado Division of Wildlife (CDOW) with consideration of landowners, but little or no general community input. A Master Development Plan (MDP) for federal lands and minerals is often used in the development of multiple proposed oil and gas wells that are in close proximity to each other and have similar producing zones. MDPs are useful when drilling is certainly going to occur and covers an area with homogeneous geologic and environmental characteristics. They are not very efficient on smaller, or individual, exploratory sites. MDPs are similar to Geographic Area Plans (GAPs) in that they analyze and plan development of a large scale oil and gas production site. The main focal points of MDPs are on the drilling plans and surface use plans of at least two or more potential well sites, typically characterized by clustered well pads. A description of required infrastructure for each well is included and covers more general development such as roads, pipelines, and storage of waste fluids. Individual operators submit MDPs to the Bureau of Land Management and include the environmental assessment required by the National Environmental Policy Act along with any information that may be required by local regulation. A MDP is usually submitted in conjunction with an Application for Permit to Drill (APD), and any deficiencies or pending corrections to the APD usually do not effect the approval of the MDP. Overall, MDPs give a comprehensive look at development and help to reduce redundancy in planning, paperwork and applications. BMPs may be voluntarily included or required as conditions of approval. For information on MOUs in Colorado see the MOU webpage or search for Keyword = MOU in the Bibliography Database. A Memorandum of Understanding (MOU) documents an agreement between a state or local government and an oil and gas operator. In the MOU, the parties agree how the oil and gas operator will develop and operate oil and gas facilities in portions of the government’s jurisdiction. In addition to leadership and cooperation amongst stakeholders, community planning requires information about projected population growth, hydrology, infrastructure, service provision, community character, costs and fiscal impacts, and more. In addition to political and regulatory dynamics, this technical information is vital to smart community growth. For communities experiencing oil and gas development, this information is needed to accurately assess potential impacts of the development and lead to successful negotiation between community stakeholders and industry. The following organizations can provide funding, technical assistance, and other support to communities who wish to work with industry to form a plan for development. Protecting Source Water in Colorado During Oil and Gas Development - This guide, released August 2016, is intended for water providers and community members interested in learning more about regulatory and non-regulatory measures to protect water quality. The guide outlines how oil and gas development could impact water quality, particularly the "source water" of our drinking water supplies. The focus of the report is how water providers and local governments can work with regulators and the oil/gas industry to negate potential impacts from oil and gas development to drinking water sources. In this report, the Colorado Department of Local Affairs provides municipalities and local governments a general guide on the issues surrounding oil and gas development, industry practices, and the regulatory authority of local governments over development. The report also addresses the impacts on communities that are not typically considered, such as loss of affordable housing or tourism revenue. This guide encourages collaboration among local governments, the Colorado Oil and Gas Conservation Commission, and industry representatives. Descriptions of mitigation strategies and case studies that give examples of these strategies are also included in the document. This guide is a great resource for communities who are interested in having a hand in the regulation of oil and gas development in their area. RESOLVE’s Solutions Network, launched in October 2010, works to mobilize leaders in business and civil society to incubate and test ideas and turn them into self-sustaining environmental, social, and health solutions. 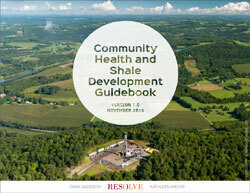 The network consulted with a multi-stakeholder working group to create the Community Health and Shale Development Guidebook. The goal is for health officials, community members and industry representatives to use this guidebook to 1) gain a basic factual understanding of the potential health issues, 2) easily access in-depth resources from a variety of perspectives, and 3) learn about some options for responding to challenges. The guidebook is organized by both project stage and the typical questions that community stakeholders might have. It also includes case examples in which companies and communities have worked together to find solutions to community concerns. This dynamic guidebook, is to be updated as new information and case studies emerge. The Union of Concerned Scientists promotes evidence-based decision making. Their Science, Democracy and Fracking Toolkit provides practical advice and resources to help communities to identify critical questions and get scientific information needed to weigh the prospects and risks of shale oil and gas development in their region. A project of the Natural Resources Law Center, the Red Lodge Clearinghouse provides a wide range of resources for participants in collaborative process involving natural resources issues. The site provides information about federal laws, upcoming events and training, stories of successful and not-so-successful collaborations, and access to technical assistance and facilitation. Additionally, the site provides valuable guides: a collaboration handbook, a guide to grant-writing, tools for environmental problem-solving, and more. The Earthworks Oil & Gas Accountability Project (OGAP) works with tribal, urban and rural communities to protect their homes and the environment from the devastating impacts of oil and gas development. OGAP provides information useful to communities and individual landowners, including workshops, fact sheets, best management practices, and model regulations. The OGAP’s guide for landowners, Oil and Gas at Your Door?, details landowners’ legal rights and offers information about the oil and gas development process. OGAP has offices in Colorado, Montana and New Mexico. The Region 8 Coordinated Regional Natural Resource Monitoring and Training Program team developed a guide, titled Land and Water Inventory Guide for Landowners in Areas of Coal Bed Methane Development, for interested landowners, which describes coal bed methane extraction processes, the positive and negative effects landowners might encounter if coal bed methane is extracted on or near their property, and potential disposal and use options for produced water. The guide encourages landowners to investigate who owns the mineral rights associated with their property, to negotiate surface use agreements with the mineral rights owner, and to document the land and water resources on their property prior to extraction commencement. The guide also briefly describes best engineering practices (BEPs) and best management practices (BMPs) so that landowners can be informed during, and possibly influence, the development process. Rapidly growing oil and gas production has raised substantial revenues for governments across the United States. This report describes key sources of oil and gas revenues for local governments in eight states, and assesses whether existing policies are providing sufficient revenue to manage increased service demands associated with a growing oil and gas industry. For more resources go to the Red Lodge Clearinghouse Facilitation Directory. Oil and gas development in a community may be regulated by federal, state and local law as well as all levels of government agencies. For a general introduction to oil and gas regulation, see the Red Lodge Clearinghouse (RLCH) Oil and Gas Resource Development page, especially Process Essentials: Federal, State and Local Regulation. This RLCH webpage includes information on planning, leasing and permitting of development as well as the assessment of impacts under the National Environmental Policy Act (NEPA). For a more detailed summary of laws and regulations applicable to oil and gas development, see the LAWS pages of our web site.